II. A Shift in America’s Youth Sport Culture? V. Is Professional Football a Uniquely Dangerous Sport? No other sport enjoys the popularity of American football in the U.S. today: roughly four in ten (38%) Americans report that their favorite sport to watch is football. Only about one in ten Americans say that basketball (11%), baseball (9%), or soccer (8%) is their favorite sport to watch. Six percent of Americans cite auto racing and five percent say hockey is their preferred pastime. However, football doesn’t rule among every part of the American population. For example, women are far less likely to prefer football than men. While close to half (46%) of men say that football is their favorite sport, less than one-third (31%) of women say the same. Racial and ethnic divisions are also evident in the popularity of different sports. While similar numbers of white (43%) and black (44%) Americans say football is their favorite sport, blacks are over three times as likely as whites to prefer basketball (29% vs. 8%, respectively). Conversely, whites are much more likely than blacks to claim ice hockey (6% vs. 1%, respectively), baseball (10% vs. 4%, respectively), and auto racing (8% vs. 0%, respectively) as their favorite sports. 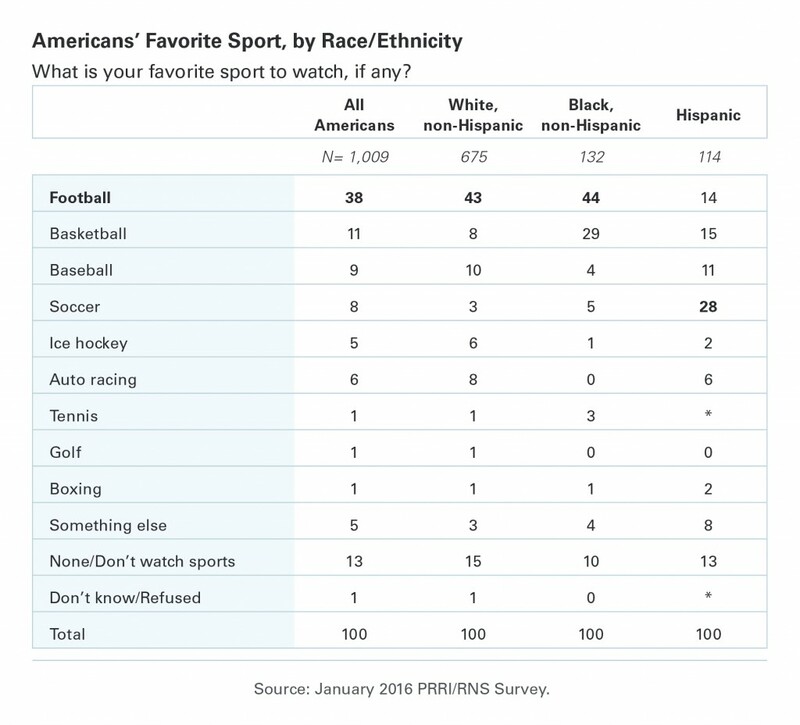 Among Hispanic Americans, soccer is by far the most popular sport to watch. Nearly three in ten (28%) Hispanic Americans report soccer is their preferred sport, while substantially fewer mention American football (14%), basketball (15%), and baseball (11%). The enduring popularity of football is even more notable given that few Americans grew up playing the sport: only 12 percent report playing it as a child. In comparison, 27 percent of Americans report that they played baseball or softball during their formative years. Similar numbers of Americans say they played basketball (14%) or soccer (12%) growing up. Soccer appears to be replacing baseball and softball as the dominant childhood sport. No youth sport was played more often among young adults (age 18-29) than soccer, with more than one-quarter (26%) of young adults saying they played soccer growing up, compared to only four percent of seniors (age 65 and older). In contrast, nearly four in ten (37%) seniors say that baseball or softball was the sport they played during childhood, while only 16% of young adults say the same. Roughly similar numbers of young adults (11%) and seniors (9%) report that they grew up playing football. Roughly two-thirds of the public report being very likely (43%) or somewhat likely (25%) to watch the Super Bowl this year, which will see the Denver Broncos take on the Carolina Panthers. Fewer than one-third (31%) say they are not too likely or not at all likely to watch. But not all Americans are eagerly anticipating the big game. Men are somewhat more likely than women to report being very likely to watch the game (49% vs. 38%, respectively). Only three in ten (30%) young adults report being very likely to tune in, compared to 40% of seniors and nearly half (49%) of middle-aged Americans (age 50-64). There are also sizable religious differences in likely Super Bowl viewership. A majority (53%) of white evangelical Protestants and half (50%) of white mainline Protestants say they are very likely to watch the game. Roughly four in ten (41%) Catholics and only about one-third (34%) of religiously unaffiliated Americans say the same. More than six in ten (62%) Americans say they have a generally favorable view of professional football, while fewer than three in ten (29%) say they have an unfavorable view of the sport. When asked what bothers them about professional football the most, Americans offer a range of responses. About one-third (32%) of Americans cite players focusing more on money than the game and 21% say that players are poor role models. 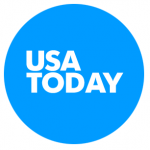 About one in five (19%) Americans mention the issue of violence and concussions. Only seven percent of the public report that what most concerns them about professional football is that it encourages negative treatment of women. Eight percent say nothing bothers them about the sport. Americans from opposite sides of the political spectrum express different concerns about professional football. More than one-quarter (26%) of Democrats cite violence or concussions as what bothers them most about the sport, compared to only 11% of Republicans. Republicans, in turn, are about twice as likely as Democrats to mention players serving as poor role models (29% vs. 16%, respectively). 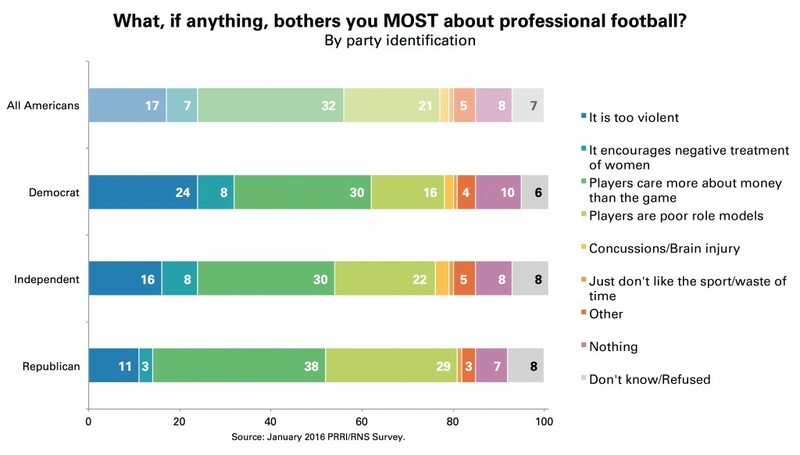 There are modest differences between men and women in perceptions of professional football’s problems. Women are more likely than men to say the violence and brain injuries is what bothers them (25% vs. 13%, respectively), but not more likely to say negative treatment of women (8% vs. 5%, respectively). There is also a notable class divide. Americans with a high school degree or less schooling are much more likely than those with a four-year college degree to say the players being overly concerned about money is what bothers them about the sport (37% vs. 23%, respectively). Conversely, Americans with a four-year college degree are more than twice as likely to say that what bothers them most about professional football is that it encourages negative treatment of women (12% vs. 5%, respectively). Although few report being bothered by the violence in the game or the issue of concussions, Americans generally perceive football as being more dangerous than other sports. More than seven in ten (71%) Americans agree that football is more dangerous than other sports, while 27% disagree. Perceptions of football as being more dangerous cut across the cultural, racial, ethnic, and religious divide. Despite the recent news reports of concussions and traumatic brain injuries suffered by some former NFL players, most Americans do not believe that professional football has become more dangerous in recent years. In fact, Americans are about as likely to say professional football has become more dangerous (21%) as to say that it has become less dangerous (24%). A slim majority (51%) of the public say the sport has not changed in recent years in terms of how dangerous it is to the players. There are substantial generational divisions in views about how dangerous football is for players. Seniors are about four times more likely than young adults to say the sport has become more dangerous (40% vs. 11%, respectively), while young adults are much more likely to say the danger to the players has lessened in recent years (35% vs. 13%, respectively). Perceptions of the dangers that football presents to players may also affect the degree of comfort Americans have with their own child playing the sport. Nearly one-third (31%) of Americans say that if they had a young son today they would not allow him to play football, while about two-thirds (66%) say that they would. The number of Americans who would prohibit their child from playing has increased since 2015, when only 22% said they would not allow their son to play. Women are more likely than men to say they would prohibit their son from playing football: 37% of women, compared to about one-quarter (26%) of men, say they would not allow their son to play. There is also an education gap on this issue. Americans with a four-year college degree are substantially more likely to say they would forbid their child from playing football than Americans with a high school education or less (41% vs. 28%, respectively). Americans who are politically liberal also exhibit greater hesitancy about having their children compete in the sport than conservatives. Close to four in ten (38%) liberals say they would not allow their son to play football, a view shared by only one-quarter (25%) of conservatives. 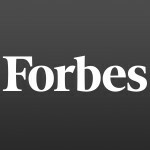 Relatively few Americans report ever having played in a fantasy sports league. Only 15% of the public say they have ever participated in a fantasy sports league, including six percent who report having done so within the last 12 months. There are modest differences between Americans who do and do not participate in fantasy sports leagues. Men are somewhat more likely than women to report having ever played in a league (19% vs. 12%, respectively). Fantasy sports league participation is also somewhat more common among college graduates (21%) than those with a high school education or less (12%). Finally, Americans between the ages 30 and 49 are more likely to participate in fantasy sports than any other age group. Nearly one-quarter (23%) of Americans in this age group have participated in a league in the past. Nearly half (48%) of the public believe that playing online fantasy sports, like FanDuel and DraftKings, constitutes gambling. Thirty percent disagree, while about one in five (21%) report being unfamiliar with these sites or refused to offer an opinion. Notably, Americans who have previously played in a fantasy sports league are more likely to say that using sites like FanDuel and DraftKings is gambling when compared to those who have never used such sites (56% vs. 47%, respectively). 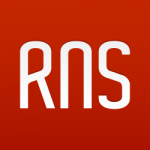 Amidst legal disputes that question if online fantasy sports sites violate gambling laws, most Americans do not have moral objections to gambling. More than six in ten (63%) Americans say that gambling is morally acceptable, while fewer than three in ten (28%) say it is morally wrong. With the exception of white evangelical Protestants and non-white Protestants, the majority of every religious group says gambling is morally acceptable. Nearly eight in ten (79%) religiously unaffiliated Americans, three-quarters (75%) of white mainline Protestants, and two-thirds (67%) of Catholics say gambling is morally acceptable. Half (50%) of white evangelical Protestants believe that gambling is morally acceptable, while more than four in ten (41%) say it is morally wrong. Non-white Protestants are closely divided over the morality of gambling: 45% say it is morally acceptable and 47% say it is not. Even among Americans who say that participating on sites like FanDuel and DraftKings constitutes gambling, most do not believe this activity is morally wrong. Nearly two-thirds (64%) of those who believe these online fantasy sport sites are gambling believe that gambling is morally acceptable. Nearly three-quarters (73%) of the public believe that football coaches at public high schools should be allowed to lead their players in Christian prayer during games, while only about one-quarter (24%) say they should not. There is agreement across the religious landscape on whether this constitutes permissible activity, although the strength of agreement varies. Ninety-three percent of white evangelical Protestants agree that football coaches should be allowed to lead players in Christian prayer during games, as do an overwhelming number of Catholics (80%), non-white Protestants (77%), and white mainline Protestants (76%). Even most religiously unaffiliated Americans appear comfortable with this idea: 55% of religiously unaffiliated Americans say coaches should be allowed to lead players in Christian prayer, while 40% disagree. Jones, Robert P., and Daniel Cox. 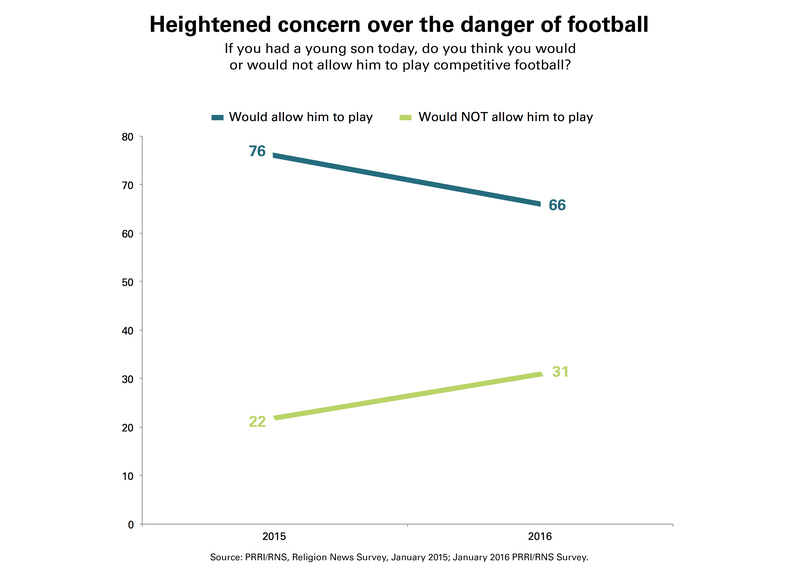 “Nearly One-Third of Americans Say They Would Not Let Their Son Play Football.” PRRI. 2016. http://www.prri.org/research/poll-football-dangers-concussion-america-favorite-sport/.